Shop adorable Chihuahua gifts for yourself or the Chihuahua lover in your life. All of our Chihuahua products are unique in that the artwork, pottery production, and decoration is done (from start to finish) here, in our Eureka, CA, Studio. This means that you will be buying something made with care, made in America, and infused with all of the joy that comes from the creative process. We offer Chihuahua gifts with 4 different coat colors, or you may have your items personalized with your Chihuahua's particular colors or markings. Just use the "custom" option in the item's page ( a small art fee will be added for all custom work). Our Chihuahua products are made for ease of use. Our stoneware is durable, so you may use daily without worry. You can put our pottery in the oven, microwave it, and dish-wash it – it'll keep coming back for more, just like your faithful friend. 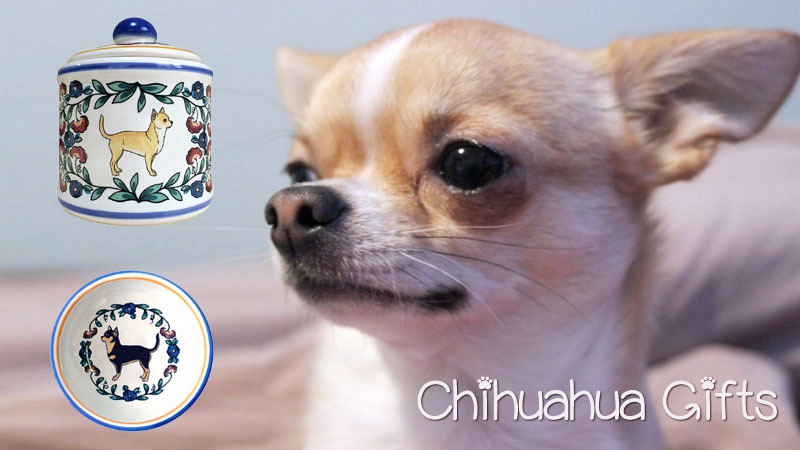 But the best part is that our Chihuahua items will keep your dog close in mind and bring a smile to your face. So, if you're at work and your office doesn't have a "bring your Chihuahua to work" policy, you can bring a beautiful reminder (like a mug or sugar bowl filled with your favorite candy) and smile the whole day long. To quote Beverly Hill's Chihuahua (hey, it's a great movie!) – Chihuahua's are small but they're mighty. One thing's for sure, they're mighty cute. Their protruding eyes, large ears, and tiny bodies just make you smile. And our Chihuahua Gifts will make you smile too!